A great friend of mine and her equally great husband live on 3110 acres in Queensland, Australia. 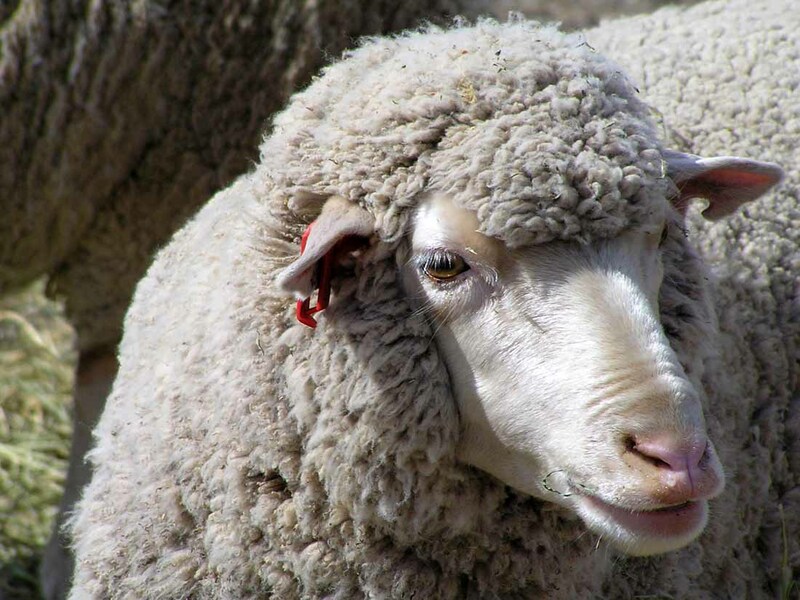 I’m partial to sheep myself, and love hearing stories about their huge flock and all the little lambs they have every year. With over 210 posts in 2010, I’ not even going to try to limit it to only one post. So here’s a couple more…. I’ve also had a lot of feedback on this post about hummingbirds and preying mantis, and in fact was just recently asked by the editor of Birds & Blooms if she could use one of these pictures. 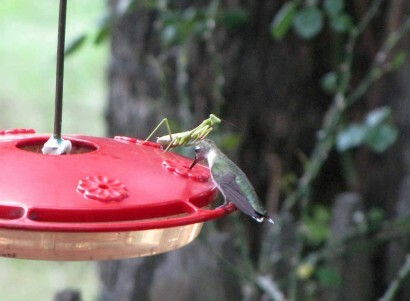 You might not think there’s much a preying mantis can do to a hummingbird, but they are actually a real danger! They spear them with one of their long forelegs, and unfortunately, that’s the end of the hummer. We really like to fowl things up around here, and chickens are one of our favorite kinds of fowl. I especially enjoy taking pictures of mother hens and their bitty chicks. It’s always fun to listen to them cluck for their little babies to follow them, and amazing to me how fierce they can be protecting them… even from creatures much bigger than they are! 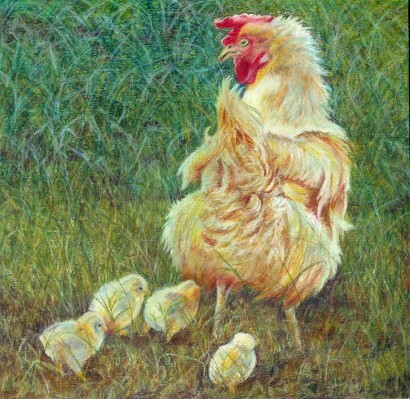 We had a bunch of Buff Orpingtons at one time, and Donna Clements asked permission to use one of the pictures to make a cool chicken drawing that won 1st Prize (non-professional division) in the Indiana County (PA) Art Association Spring Show of 2010. Didn’t she do a great job? I have often wished I could draw, but alas, I have never graduated beyond kindgergarden level pictures. Just one more from 2010! I’m having a hard time picking and choosing! Several posts got a lot of views, and this was one of them. It features our Lady Llama and was one of those funny “can’t believe she did that” times on the farm. The Farmer put a bunch of Maypop fruits on top of the wellhouse to dry out so he could save the seeds. 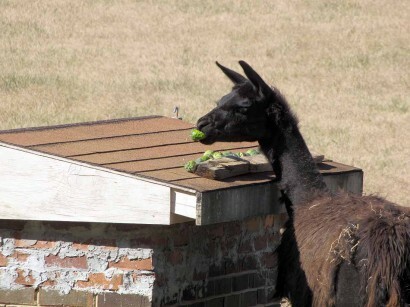 Well, his plan didn’t quite work out. . .
. . . cause it turns out our llama likes maypops! There’s even a video in that post showing her munching up on maypops, until the last one is gone! Okay, once more the post is getting a little long and don’t want to put too many pictures in here, so stay tuned for part three!